SrIperumbUthUr – AvaNi pUsam (yesterday) – http://sriperumbuthur.blogspot.com/2016/08/august-2016-week-5.html . thirukkuLanthai (perunguLam) – pavithrOthsavam day 2 (yesterday) – http://thirukkulanthai.koyil.org/?p=463 . SrIvaishNava Education/Kids Portal – nampiLLai – http://pillai.koyil.org/index.php/2016/08/beginners-guide-nampillai/ – new article by jAnaki ammangar as part of Beginner’s guide http://pillai.koyil.org/index.php/beginners–guide/ . thiruvAimozhi 3.5.1 – moymmAm pUmpozhil – http://divyaprabandham.koyil.org/index.php/2016/08/thiruvaimozhi-3-5-1-moymmam-pumpozhil/ – English translation. Full series can be viewed at http://divyaprabandham.koyil.org/index.php/thiruvaimozhi/ . rAmAnusa nURRanthAdhi pAsuram 49 – http://divyaprabandham.koyil.org/index.php/2016/08/ramanusa-nurranthadhi-49/ – English translation by raghurAm swamy. Full series can be viewed at http://divyaprabandham.koyil.org/index.php/2015/07/ramanusa-nurranthadhi/ . SrIperumbUthUr – AvaNi punarpUsam (yesterday) – http://sriperumbuthur.blogspot.com/2016/08/august-2016-week-5.html . thirukkuLanthai (perunguLam) – pavithrOthsavam day 1 (yesterday) – http://thirukkulanthai.koyil.org/?p=463 . Commencement of thiruvAimozhi 3.5 – moymmA – http://divyaprabandham.koyil.org/index.php/2016/08/thiruvaimozhi-3-5-moymma/ – English translation. Full series can be viewed at http://divyaprabandham.koyil.org/index.php/thiruvaimozhi/ . thirumAlai – pAsuram 9 – http://divyaprabandham.koyil.org/index.php/2016/08/thirumalai-9/ – English translation by T N krishNan swamy. Full series can be viewed at http://divyaprabandham.koyil.org/index.php/2016/07/thirumalai/ . http://divyaprabandham.koyil.org/index.php/2015/11/saranagathi-gadhyam/ – Hindi translation by bhagavathi ammangar. Full series can be viewed at http://divyaprabandham.koyil.org/index.php/2016/08/saranagathi-gadhyam-hindi/ . SrIperumbUthUr – EkAdhaSi, AvaNi thiruvAdhirai (yesterday) – http://sriperumbuthur.blogspot.com/2016/08/august-2016-week-5.html . bhagavath gIthA – 2nd chapter, SlOkams 69 to 72 added in http://githa.koyil.org/index.php/chapter-2/ based on http://githa.koyil.org/index.php/chapter-2-original/ . With this, second chapter is completed. thiruvAimozhi 3.4.11 – kUdi vaNdaRaiyum – http://divyaprabandham.koyil.org/index.php/2016/08/thiruvaimozhi-3-4-11-kudi-vandaraiyum/ – English translation. Full series can be viewed at http://divyaprabandham.koyil.org/index.php/thiruvaimozhi/ . Commencement of SaraNAgathi gadhyam hindi translation http://divyaprabandham.koyil.org/index.php/2016/08/saranagathi-gadhyam-hindi/ based on http://divyaprabandham.koyil.org/index.php/2015/11/saranagathi-gadhyam/ . Translation by bhagavathi ammangar. http://divyaprabandham.koyil.org/index.php/2016/06/arththi-prabandham-thaniyans/ – Hindi translation by preethi ammangar. Full series can be viewed at http://divyaprabandham.koyil.org/index.php/2016/08/arththi-prabandham-hindi/ . pachchaivAraNam (pEttai) – SrI jayanthi and uRiyadi uthsavam (upto yesterday) – http://purushamangalam.koyil.org/?p=514 . SrIperumbUthUr – AvaNi mrgaSIrsham, uRiyadi uthsavam (yesterday) – http://sriperumbuthur.blogspot.com/2016/08/august-2016-week-4.html . thiruvallikkENi – uRiyadi uthsavam (yesterday) – http://thiruvallikkeni.koyil.org/?p=478 . bhagavath gIthA – 2nd chapter, SlOkams 65 to 68 added in http://githa.koyil.org/index.php/chapter-2/ based on http://githa.koyil.org/index.php/chapter-2-original/ . thiruvAimozhi 3.4.10 – yAvaiyum yavarum – http://divyaprabandham.koyil.org/index.php/2016/08/thiruvaimozhi-3-4-10-yavaiyum-yavarum/ – English translation. Full series can be viewed at http://divyaprabandham.koyil.org/index.php/thiruvaimozhi/ . rAmAnusa nURRanthAdhi pAsuram 48 – http://divyaprabandham.koyil.org/index.php/2016/08/ramanusa-nurranthadhi-48/ – English translation by raghurAm swamy. Full series can be viewed at http://divyaprabandham.koyil.org/index.php/2015/07/ramanusa-nurranthadhi/ . This entry was posted in Uncategorized on August 27, 2016 by Sarathy Thothathri. AvaNi rOhiNi (yesterday) – http://sriperumbuthur.blogspot.com/2016/08/august-2016-week-4.html . embAr jIyar mutt – 1st jIyar thirunakshathram celebrations day 3 (yesteraday) – http://embarjiyarmutt.koyil.org/?p=223 . thiruvAimozhi 3.4.9 – kaNNanai mAyan – http://divyaprabandham.koyil.org/index.php/2016/08/thiruvaimozhi-3-4-9-kannanai-mayan/ – English translation. Full series can be viewed at http://divyaprabandham.koyil.org/index.php/thiruvaimozhi/ . thirumAlai – pAsuram 8 – http://divyaprabandham.koyil.org/index.php/2016/08/thirumalai-8/ – English translation by T N krishNan swamy. Full series can be viewed at http://divyaprabandham.koyil.org/index.php/2016/07/thirumalai/ . AvaNi kArthigai (yesterday) – http://sriperumbuthur.blogspot.com/2016/08/august-2016-week-4.html . embAr jIyar mutt – 1st jIyar thirunakshathram celebrations day 2 (yesteraday) – http://embarjiyarmutt.koyil.org/?p=223 . bhagavath gIthA – 2nd chapter, SlOkam 64 added in http://githa.koyil.org/index.php/chapter-2/ based on http://githa.koyil.org/index.php/chapter-2-original/ . SrIvaishNava granthams – virOdhi parihArangaL part 15 – https://srivaishnavagranthamshindi.wordpress.com/2016/08/25/virodhi-pariharangal-15/ based on http://ponnadi.blogspot.in/2014/02/virodhi-pariharangal-15.html – hindi translation by kEshav swamy. Full series can be viewed at https://srivaishnavagranthamshindi.wordpress.com/virodhi-pariharangal/ . dhivya prabandham – thiruvAimozhi 3.4.8 – oLi maNivaNNan – http://divyaprabandham.koyil.org/index.php/2016/08/thiruvaimozhi-3-4-8-oli-manivannan/ – English translation. Full series can be viewed at http://divyaprabandham.koyil.org/index.php/thiruvaimozhi/ . AvaNi bharaNi (yesterday) – http://sriperumbuthur.blogspot.com/2016/08/august-2016-week-4.html . embAr jIyar mutt – 1st jIyar thirunakshathram celebrations day 1 (yesteraday) – http://embarjiyarmutt.koyil.org/?p=223 . SrIvaishNava Education/Kids Portal – nanjIyar – http://pillai.koyil.org/index.php/2016/08/beginners-guide-nanjiyar/ – new article by jAnaki ammangar as part of Beginner’s guide http://pillai.koyil.org/index.php/beginners-guide/ . thirumazhisai AzhwAr – http://pillai.koyil.org/index.php/2016/08/beginners-guide-thirumazhisai-azhwar-tamil/ based on http://pillai.koyil.org/index.php/2014/11/beginners-guide-thirumazhisai-azhwar/ – thamizh translation by geethA ammangar as part of Beginner’s guide (ஸ்ரீவைஷ்ணவம் – பால பாடம்) – http://pillai.koyil.org/index.php/beginners-guide-tamil/ based on http://pillai.koyil.org/index.php/beginners-guide/ . thiruvAimozhi 3.4.7 – vAnavar Adhi – http://divyaprabandham.koyil.org/index.php/2016/08/thiruvaimozhi-3-4-7-vanavar-adhi/ – English translation. Full series can be viewed at http://divyaprabandham.koyil.org/index.php/thiruvaimozhi/ . rAmAnusa nURRanthAdhi pAsuram 47 – http://divyaprabandham.koyil.org/index.php/2016/08/ramanusa-nurranthadhi-47/ – English translation by raghurAm swamy. Full series can be viewed at http://divyaprabandham.koyil.org/index.php/2015/07/ramanusa-nurranthadhi/ . SrIperumbUthUr – AvaNi aSwini (yesterday) – http://sriperumbuthur.blogspot.com/2016/08/august-2016-week-4.html . bhagavath gIthA – 2nd chapter, SlOkams 60 to 63 added in http://githa.koyil.org/index.php/chapter-2/ based on http://githa.koyil.org/index.php/chapter-2-original/ . thiruvAimozhi 3.4.6 – pAlenkO – http://divyaprabandham.koyil.org/index.php/2016/08/thiruvaimozhi-3-4-6-palenko/ – English translation. Full series can be viewed at http://divyaprabandham.koyil.org/index.php/thiruvaimozhi/ . yathirAja vimSathi English translation – Slokams 14 to 20 uploaded in http://divyaprabandham.koyil.org/index.php/2016/08/yathiraja-vimsathi/ based on http://divyaprabandham.koyil.org/index.php/2015/10/yathiraja-vimsathi-tamil/ . Translation by Dr M Varadarajan swamy. Uploaded by vEnkatEsh swamy. This was previously published in SrI rAmAnuja dharSanam monthly magazine. With this, the prabandham is completed. guru paramaparai – piLLai uRangA villi dhAsar – life and glories in thamizh – https://guruparamparaitamil.wordpress.com/2016/08/22/pillai-uranga-villi-dhasar/ based on http://guruparamparai.wordpress.com/2013/02/22/pillai-uranga-villi-dhasar/ – new article by SrIvaramangA ammangar and santhAnakrishNan swamy dhampathi . Please visit https://guruparamparaitamil.wordpress.com/2015/03/14/introduction-2/ to see the full list. http://ponnadi.blogspot.in/2015/12/simple-guide-to-srivaishnavam-pancha-samskaram.html – kannada translation by SrinivAsan swamy. Full series can be viewed at https://srivaishnavagranthamskannada.wordpress.com/simple-guide-to-srivaishnavam/ . pUrvAchArya literature (Comprehensive listing of all works of pUrvAchAryas) – English e-book link available at https://srivaishnavagranthams.wordpress.com/purvacharya-literature/ and https://srivaishnavagranthams.wordpress.com/e-books/ . Thanks to parAsara (pradeep) swamy for preparing the e-book. thirumAlai – pAsuram 7 – http://divyaprabandham.koyil.org/index.php/2016/08/thirumalai-7/ – English translation by T N krishNan swamy. Full series can be viewed at http://divyaprabandham.koyil.org/index.php/2016/07/thirumalai/ . SrIvaishNava Education/Kids Portal – mudhalAzhwArgaL (first 3 AzhwArs) – Part 2 – http://pillai.koyil.org/index.php/2016/08/beginners-guide-mudhalazhwargal-part-2-tamil/ based on http://pillai.koyil.org/index.php/2014/11/beginners-guide-mudhalazhwargal-part-2/ – thamizh translation by geethA ammangar as part of Beginner’s guide (ஸ்ரீவைஷ்ணவம் – பால பாடம்) – http://pillai.koyil.org/index.php/beginners-guide-tamil/ based on http://pillai.koyil.org/index.php/beginners-guide/ . Arththi prabandham – pAsuram 21 – http://divyaprabandham.koyil.org/index.php/2016/08/arththi-prabandham-21/ – English translation by santhAnam swamy. Full series can be viewed at – http://divyaprabandham.koyil.org/index.php/2016/05/arththi-prabandham/ . mangaLa SlOkams – thamizh/English e-book link available at https://srivaishnavagranthams.wordpress.com/e-books/ and http://divyaprabandham.koyil.org/index.php/e-books/ . Thanks to parAsara (pradeep) swamy for preparing the e-book. vAzhi thirunAmams – thamizh/English e-book link available at https://srivaishnavagranthams.wordpress.com/e-books/ and http://divyaprabandham.koyil.org/index.php/e-books/ . Thanks to parAsara (pradeep) swamy for preparing the e-book. SrIperumbUthUr – AvaNi pUrattAdhi, SrI rAma parivAr bAlAlayam day 2 (yesterday) – http://sriperumbuthur.blogspot.com/2016/08/august-2016-week-3.html . bhagavath gIthA – 2nd chapter, SlOkam 59 added in http://githa.koyil.org/index.php/chapter-2/ based on http://githa.koyil.org/index.php/chapter-2-original/ . SrIvaishNava Education/Kids Portal – mudhalAzhwArgaL (first 3 AzhwArs) – Part 1 – http://pillai.koyil.org/index.php/2016/08/beginners-guide-mudhalazhwargal-part-1-tamil/ based on http://pillai.koyil.org/index.php/2014/11/beginners-guide-mudhalazhwargal-part-1/ – thamizh translation by geethA ammangar as part of Beginner’s guide (ஸ்ரீவைஷ்ணவம் – பால பாடம்) – http://pillai.koyil.org/index.php/beginners-guide-tamil/ based on http://pillai.koyil.org/index.php/beginners-guide/ . thiruvAimozhi 3.4.5 – achchudhan amalan – http://divyaprabandham.koyil.org/index.php/2016/08/thiruvaimozhi-3-4-5-achchudhan-amalan/ – English translation. Full series can be viewed at http://divyaprabandham.koyil.org/index.php/thiruvaimozhi/ . thirumAlai – pAsuram 6 – http://divyaprabandham.koyil.org/index.php/2016/08/thirumalai-6/ – English translation by T N krishNan swamy. Full series can be viewed at http://divyaprabandham.koyil.org/index.php/2016/07/thirumalai/ . This entry was posted in Uncategorized on August 21, 2016 by Sarathy Thothathri. SrIperumbUthUr – AvaNi sathayam, Friday, SrI rAma parivAr bAlAlayam day 1 (yesterday) – http://sriperumbuthur.blogspot.com/2016/08/august-2016-week-3.html . SrIvaishNava Education/Kids Portal – Introduction to AzhwArs – http://pillai.koyil.org/index.php/2016/08/beginners-guide-introduction-to-azhwars-tamil/ based on http://pillai.koyil.org/index.php/2014/10/beginners-guide-introduction-to-azhwars/ – thamizh translation by geethA ammangar as part of Beginner’s guide (ஸ்ரீவைஷ்ணவம் – பால பாடம்) – http://pillai.koyil.org/index.php/beginners-guide-tamil/ based on http://pillai.koyil.org/index.php/beginners-guide/ . thiruvAimozhi 3.3 – English e-book link available at http://divyaprabandham.koyil.org/index.php/2016/07/thiruvaimozhi-3rd-centum/ and http://divyaprabandham.koyil.org/index.php/e-books/ . Thanks to parAsara (pradeep) swamy for preparing the e-book. rAmAnusa nURRanthAdhi pAsuram 46 – http://divyaprabandham.koyil.org/index.php/2016/08/ramanusa-nurranthadhi-46/ – English translation by raghurAm swamy. Full series can be viewed at http://divyaprabandham.koyil.org/index.php/2015/07/ramanusa-nurranthadhi/ . Arththi prabandham – pAsuram 20 – http://divyaprabandham.koyil.org/index.php/2016/08/arththi-prabandham-20/ – English translation by santhAnam swamy. Full series can be viewed at – http://divyaprabandham.koyil.org/index.php/2016/05/arththi-prabandham/ . 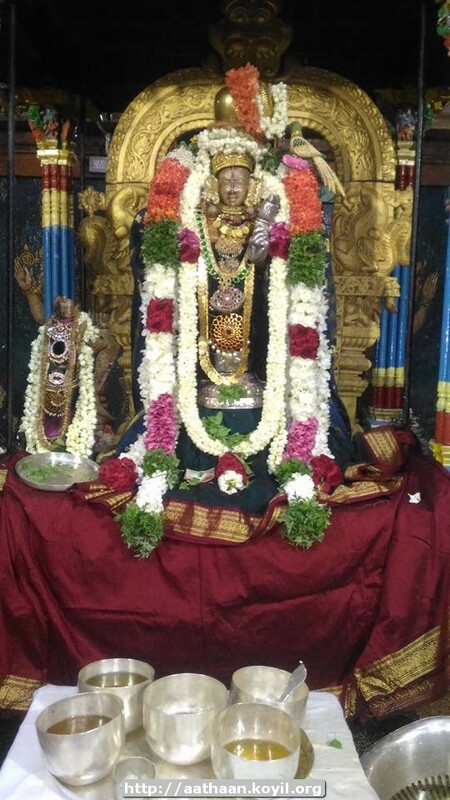 AzhwArthirunagari – Adi uthrAdam celebrations for ALavandhAr (12th to 16th) – http://bhavishyadhacharyan.koyil.org/?p=401 . SrIperumbUthUr – AvaNi avittam, paurNami (yesterday) – http://sriperumbuthur.blogspot.com/2016/08/august-2016-week-3.html . SrIvaishNava Education/Kids Portal – bhattar – http://pillai.koyil.org/index.php/2016/08/beginners-guide-bhattar/ – new article by jAnaki ammangar as part of Beginner’s guide http://pillai.koyil.org/index.php/beginners-guide/ . thiruvAimozhi 3.4.4 – sAdhi mANikkam – http://divyaprabandham.koyil.org/index.php/2016/08/thiruvaimozhi-3-4-4-sadhi-manikkam/ – English translation. Full series can be viewed at http://divyaprabandham.koyil.org/index.php/thiruvaimozhi/ . rAmAnusa nURRanthAdhi pAsuram 45 – http://divyaprabandham.koyil.org/index.php/2016/08/ramanusa-nurranthadhi-45/ – English translation by raghurAm swamy. Full series can be viewed at http://divyaprabandham.koyil.org/index.php/2015/07/ramanusa-nurranthadhi/ . Commencement of Arththi prabandham hindi translation http://divyaprabandham.koyil.org/index.php/2016/08/arththi-prabandham-hindi/ based on http://divyaprabandham.koyil.org/index.php/2016/05/arththi-prabandham/ . Translation by preethi ammangar. SrIperumbUthUr – AvaNi SravaNam, mAsa pravESam (yesterday) – http://sriperumbuthur.blogspot.com/2016/08/august-2016-week-3.html . bhagavath gIthA – 2nd chapter, SlOkam 56 to 58 added in http://githa.koyil.org/index.php/chapter-2/ based on http://githa.koyil.org/index.php/chapter-2-original/ . guru paramaparai – appiLLai – life and glories in thamizh – https://guruparamparaitamil.wordpress.com/2016/08/17/appillai/ based on http://guruparamparai.wordpress.com/2013/10/19/appillai/ – new article by new article by magizhmARan swamy . Please visit https://guruparamparaitamil.wordpress.com/2015/03/14/introduction-2/ to see the full list. thiruvAimozhi 3.4.3 – pangayak kaNNan – http://divyaprabandham.koyil.org/index.php/2016/08/thiruvaimozhi-3-4-3-pangayak-kannan/ – English translation. Full series can be viewed at http://divyaprabandham.koyil.org/index.php/thiruvaimozhi/ . rAmAnusa nURRanthAdhi pAsuram 44 – http://divyaprabandham.koyil.org/index.php/2016/08/ramanusa-nurranthadhi-44/ – English translation by raghurAm swamy. Full series can be viewed at http://divyaprabandham.koyil.org/index.php/2015/07/ramanusa-nurranthadhi/ . pachchaivAraNam (pEttai) – pavithrOthsavam days 2 and 3 (upto yesterday) – http://purushamangalam.koyil.org/?p=504 . SrIperumbUthUr – Adi uthrAdam, ALavandhAr thirunakshathra mahOthsavam day 10 (yesterday) – http://sriperumbuthur.blogspot.com/2016/08/august-2016-week-3.html . bhagavath gIthA – 2nd chapter, SlOkam 55 added in http://githa.koyil.org/index.php/chapter-2/ based on http://githa.koyil.org/index.php/chapter-2-original/ . thiruvAimozhi 3.4.2 – kUvumARu – http://divyaprabandham.koyil.org/index.php/2016/08/thiruvaimozhi-3-4-2-kuvumaru/ – English translation. Full series can be viewed at http://divyaprabandham.koyil.org/index.php/thiruvaimozhi/ . thiruvAimozhi 3.2 – English e-book link available at http://divyaprabandham.koyil.org/index.php/2016/07/thiruvaimozhi-3rd-centum/ and http://divyaprabandham.koyil.org/index.php/e-books/ . Thanks to parAsara (pradeep) swamy for preparing the e-book. 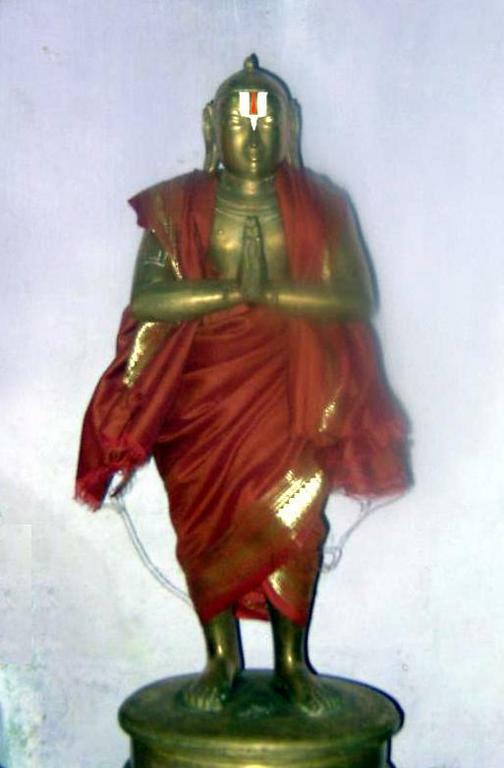 thirunakshathram today – yAmunAchArya (ALavandhAr) – http://acharyas.koyil.org/index.php/alavandhar/ . SrIperumbUthUr – Adi pUrAdam, ALavandhAr thirunakshathra mahOthsavam day 9 (yesterday) – http://sriperumbuthur.blogspot.com/2016/08/august-2016-week-3.html . SrIvaishNava Education/Kids Portal – embAr – http://pillai.koyil.org/index.php/2016/08/beginners-guide-embar/ – new article by jAnaki ammangar as part of Beginner’s guide http://pillai.koyil.org/index.php/beginners-guide/ . Audio recording of thiruvAimozhi 3.4 – pugazhum – http://divyaprabandham.koyil.org/index.php/2016/08/thiruvaimozhi-3-4-audio/ . thirumAlalai – pAsuram 5 – http://divyaprabandham.koyil.org/index.php/2016/08/thirumalai-5/ – English translation by T N krishNan swamy. Full series can be viewed at http://divyaprabandham.koyil.org/index.php/2016/07/thirumalai/ . nAthankOyil – pavithrOthsavam day 1 (yesterday) – https://plus.google.com/photos/107723698299182214927/albums/6318825630575110961 – Thanks to SatakOpan swamy for the pictures. pachchaivAraNam (pEttai) – pavithrOthsavam day 1 (yesterday) – http://purushamangalam.koyil.org/?p=504 . SrIperumbUthUr – Adi thirumUlam, ALavandhAr thirunakshathra mahOthsavam day 8 (yesterday) – http://sriperumbuthur.blogspot.com/2016/08/august-2016-week-3.html . thiruvAimozhi 3.4.1 – pugazhum nal oruvan – http://divyaprabandham.koyil.org/index.php/2016/08/thiruvaimozhi-3-4-1-pugazhum-nal-oruvan/ – English translation. Full series can be viewed at http://divyaprabandham.koyil.org/index.php/thiruvaimozhi/ . Audio recording of thiruvAimozhi 3.3 – ozhivil – http://divyaprabandham.koyil.org/index.php/2016/08/thiruvaimozhi-3-3-audio/ . rAmAnusa nURRanthAdhi pAsuram 43 – http://divyaprabandham.koyil.org/index.php/2016/08/ramanusa-nurranthadhi-43/ – English translation by raghurAm swamy. Full series can be viewed at http://divyaprabandham.koyil.org/index.php/2015/07/ramanusa-nurranthadhi/ . nAthankOyil – pavithrOthsavam ankurArpaNam (yesterday) – https://plus.google.com/photos/107723698299182214927/albums/6318462701333082081 – Thanks to SatakOpan swamy for the pictures. pachchaivAraNam (pEttai) – pavithrOthsavam ankurArpaNam (yesterday) – http://purushamangalam.koyil.org/?p=504 . SrIperumbUthUr – Adi kEttai, ALavandhAr thirunakshathra mahOthsavam day 7 (yesterday) – http://sriperumbuthur.blogspot.com/2016/08/august-2016-week-2.html . thirumandangudi – pavithrOthsavam day 3 (yesterday) – https://plus.google.com/photos/107723698299182214927/albums/6318463120432861121 – Thanks to SatakOpan swamy for the pictures. bhagavath gIthA – 2nd chapter, SlOkams 50 to 54 added in http://githa.koyil.org/index.php/chapter-2/ based on http://githa.koyil.org/index.php/chapter-2-original/ . SrIvaishNava Education/Kids Portal – SrIman nArAyaNa’s divine mercy – http://pillai.koyil.org/index.php/2016/08/beginners-guide-sriman-narayanas-divine-mercy-tamil/ based on http://pillai.koyil.org/index.php/2014/09/beginners-guide-sriman-narayanas-divine-mercy/ – thamizh translation by geethA ammangar as part of Beginner’s guide (ஸ்ரீவைஷ்ணவம் – பால பாடம்) – http://pillai.koyil.org/index.php/beginners-guide-tamil/ based on http://pillai.koyil.org/index.php/beginners-guide/ . dhivya prabandham – Commencement of thiruvAimozhi 3.4 – pugazhum – http://divyaprabandham.koyil.org/index.php/2016/08/thiruvaimozhi-3-4-pugazhum/ – English translation. Full series can be viewed at http://divyaprabandham.koyil.org/index.php/thiruvaimozhi/ . This entry was posted in Uncategorized on August 13, 2016 by Sarathy Thothathri. SrIperumbUthUr – Adi anusham, ALavandhAr thirunakshathra mahOthsavam day 6 (yesterday) – http://sriperumbuthur.blogspot.com/2016/08/august-2016-week-2.html . thirumandangudi – pavithrOthsavam day 2 (yesterday) – https://plus.google.com/photos/107723698299182214927/albums/6318092544736510641 – Thanks to SatakOpan swamy for the pictures. thirumeyyam – ANdAL thirunakshathra mahOthsavam – day 8 (yesterday) – http://thirumeyyam.koyil.org/?p=376 . SrI rAmAnuja dharsanam – e-magazine – August/Adi – thamizh Issue recently released and can be viewed at http://www.varavaramuni.com/home/sriramanuja-dharsanam-magazine/thamizh . bhagavath gIthA – 2nd chapter, SlOkam 49 added in http://githa.koyil.org/index.php/chapter-2/ based on http://githa.koyil.org/index.php/chapter-2-original/ . guru paramaparai – thiruvarangaththu amudhanAr – life and glories in thamizh – https://guruparamparaitamil.wordpress.com/2016/08/11/thiruvarangathu-amudhanar/ based on https://guruparamparai.wordpress.com/2013/03/26/thiruvarangathu-amudhanar/ – new article by new article by sadagopan swamy . Please visit https://guruparamparaitamil.wordpress.com/2015/03/14/introduction-2/ to see the full list. thiruvAimozhi 3.3.11 – thAL parappi – http://divyaprabandham.koyil.org/index.php/2016/08/thiruvaimozhi-3-3-11-thal-parappi/ – English translation. Full series can be viewed at http://divyaprabandham.koyil.org/index.php/thiruvaimozhi/ . rAmAnusa nURRanthAdhi pAsuram 42 – http://divyaprabandham.koyil.org/index.php/2016/08/ramanusa-nurranthadhi-42/ – English translation by raghurAm swamy. Full series can be viewed at http://divyaprabandham.koyil.org/index.php/2015/07/ramanusa-nurranthadhi/ . SrIperumbUthUr – Adi visAgam, ALavandhAr thirunakshathra mahOthsavam day 5 (yesterday) – http://sriperumbuthur.blogspot.com/2016/08/august-2016-week-2.html . thirumandangudi – pavithrOthsavam day 1 (yesterday) – https://plus.google.com/photos/107723698299182214927/albums/6317720571785593185 – Thanks to SatakOpan swamy for the pictures. SrIvaishNava Education/Kids Portal – rAmAnujar Part 2 – http://pillai.koyil.org/index.php/2016/08/beginners-guide-ramanujar-2/ – new article by jAnaki ammangar as part of Beginner’s guide http://pillai.koyil.org/index.php/beginners-guide/ . SrIvaishNava granthams – charamOpAya nirNayam – SrI rAmAnuja’s glories – https://srivaishnavagranthamstelugu.wordpress.com/2016/08/09/charamopaya-nirnayam-ramanujars-glories/ based on https://ponnadi.blogspot.in/2012/12/charamopaya-nirnayam-ramanujars-glories.html – telugu translation (new article) by SrInivAsa rAmAnuja swamy. Full series can be viewed at https://srivaishnavagranthamstelugu.wordpress.com/charamopaya-nirnayam/ . thiruvAimozhi 3.3.10 – vaiththa nAL – http://divyaprabandham.koyil.org/index.php/2016/08/thiruvaimozhi-3-3-10-vaiththa-nal/ – English translation. Full series can be viewed at http://divyaprabandham.koyil.org/index.php/thiruvaimozhi/ . thirumAlalai – pAsuram 4 – http://divyaprabandham.koyil.org/index.php/2016/08/thirumalai-4/ – English translation by T N krishNan swamy. Full series can be viewed at http://divyaprabandham.koyil.org/index.php/2016/07/thirumalai/ . SrI vaikuNta gadhyam – English e-book link available at srivaikunta gadhyam ebook – http://divyaprabandham.koyil.org/index.php/2016/03/srivaikunta-gadhyam/ and http://divyaprabandham.koyil.org/index.php/e-books/ . Thanks to parAsara (pradeep) swamy for preparing the e-book. yathirAja vimSathi English translation – Slokams 4 to 13 uploaded in http://divyaprabandham.koyil.org/index.php/2016/08/yathiraja-vimsathi/ based on http://divyaprabandham.koyil.org/index.php/2015/10/yathiraja-vimsathi-tamil/ . Translation by Dr M Varadarajan swamy. Uploaded by vEnkatEsh swamy. This was previously published in SrI rAmAnuja dharSanam monthly magazine. AzhwArthirunagari – pakshirAjar uthsavam day 9 (yesterday) – http://azhwarthirunagari.koyil.org/?p=1047 . kapisthalam – pavithrOthsavam day 3 (yesterday) – https://plus.google.com/photos/107723698299182214927/albums/6317350652749780689 – Thanks to satakOpan swamy for the pictures . nAthankOyil – Adi swAthi garuda sEvai (yesterday) – https://plus.google.com/photos/107723698299182214927/albums/6317351169564376097 – Thanks to ananthu swamy for the pictures . SrIperumbUthUr – Adi swAthi, ALavandhAr thirunakshathra mahOthsavam day 4 (yesterday) – http://sriperumbuthur.blogspot.com/2016/08/august-2016-week-2.html . vAnamAmalai – Adi swAthi garuda sEvai (yesterday) – http://vanamamalai.koyil.org/?p=854 . bhagavath gIthA – 2nd chapter, SlOkams 46 to 48 added in http://githa.koyil.org/index.php/chapter-2/ based on http://githa.koyil.org/index.php/chapter-2-original/ . SrIvaishNava Education/Kids Portal – SrI mahAlakshmi’s motherly nature – http://pillai.koyil.org/index.php/2016/08/beginners-guide-sri-mahalakshmis-motherly-nature-tamil/ based on http://pillai.koyil.org/index.php/2014/08/beginners-guide-sri-mahalakshmis-motherly-nature/ – thamizh translation by geethA ammangar as part of Beginner’s guide (ஸ்ரீவைஷ்ணவம் – பால பாடம்) – http://pillai.koyil.org/index.php/beginners-guide-tamil/ based on http://pillai.koyil.org/index.php/beginners-guide/ . thiruvAimozhi 3.3.9 – OyumUppu – http://divyaprabandham.koyil.org/index.php/2016/08/thiruvaimozhi-3-3-9-oyumuppu/ – English translation. Full series can be viewed at http://divyaprabandham.koyil.org/index.php/thiruvaimozhi/ . rAmAnusa nURRanthAdhi pAsuram 41 – http://divyaprabandham.koyil.org/index.php/2016/08/ramanusa-nurranthadhi-41/ – English translation by raghurAm swamy. Full series can be viewed at http://divyaprabandham.koyil.org/index.php/2015/07/ramanusa-nurranthadhi/ . SrIperumbUthUr – Adi chithrai, ALavandhAr thirunakshathra mahOthsavam day 3 (yesterday) – http://sriperumbuthur.blogspot.com/2016/08/august-2016-week-2.html . bhagavath gIthA – 2nd chapter, SlOkams 41 to 45 added in http://githa.koyil.org/index.php/chapter-2/ based on http://githa.koyil.org/index.php/chapter-2-original/ . SrIvaishNava Education/Kids Portal – rAmAnujar Part 1 – http://pillai.koyil.org/index.php/2016/08/beginners-guide-ramanujar-1/ – new article by jAnaki ammangar as part of Beginner’s guide http://pillai.koyil.org/index.php/beginners-guide/ . dhivya prabandham – thiruvAimozhi 3.3.8 – kunRam Endhi – http://divyaprabandham.koyil.org/index.php/2016/08/thiruvaimozhi-3-3-8-kunram-endhi/ – English translation. Full series can be viewed at http://divyaprabandham.koyil.org/index.php/thiruvaimozhi/ . AzhwArthirunagari – pakshirAjar uthsavam day 8 (yesterday) – http://azhwarthirunagari.koyil.org/?p=1047 . SrIperumbUthUr – Adi hastham, ALavandhAr thirunakshathra mahOthsavam day 2 (yesterday) – http://sriperumbuthur.blogspot.com/2016/08/august-2016-week-2.html . bhagavath gIthA – 2nd chapter, SlOkams 36 to 40 added in http://githa.koyil.org/index.php/chapter-2/ based on http://githa.koyil.org/index.php/chapter-2-original/ . SrIvaishNava Education/Kids Portal – SrIman nArAyaNa’s divine archA form and qualities – http://pillai.koyil.org/index.php/2016/08/beginners-guide-sriman-narayanas-divine-archa-form-and-qualities-tamil/ based on http://pillai.koyil.org/index.php/2014/08/beginners-guide-sriman-narayanas-divine-archa-form-and-qualities/ – thamizh translation by geethA ammangar as part of Beginner’s guide (ஸ்ரீவைஷ்ணவம் – பால பாடம்) – http://pillai.koyil.org/index.php/beginners-guide-tamil/ based on http://pillai.koyil.org/index.php/beginners-guide/ . dhivya prabandham – thiruvAimozhi 3.3.7 – sumandhu mAmalar – http://divyaprabandham.koyil.org/index.php/2016/08/thiruvaimozhi-3-3-7-sumandhu-mamalar/ – English translation. Full series can be viewed at http://divyaprabandham.koyil.org/index.php/thiruvaimozhi/ . AzhwArthirunagari – pakshirAjar uthsavam day 7 (yesterday) – http://azhwarthirunagari.koyil.org/?p=1047 . SrIperumbUthUr – Adi uthram, ALavandhAr thirunakshathra mahOthsavam day 1 (yesterday) – http://sriperumbuthur.blogspot.com/2016/08/august-2016-week-1.html . SrIvillipuththUr – ANdAL thirunakshathra mahOthsavam – days 10 and 11 (upto yesterday) – http://srivilliputhur.koyil.org/?p=527 . SrI rAmAnuja dharsanam – e-magazine – March/mIna – hindi Issue recently released and can be viewed at http://www.varavaramuni.com/home/sriramanuja-dharsanam-magazine/hindi . thiruvAimozhi 3.3.6 – vEnkatangaL – http://divyaprabandham.koyil.org/index.php/2016/08/thiruvaimozhi-3-3-6-venkatangal/ – English translation. Full series can be viewed at http://divyaprabandham.koyil.org/index.php/thiruvaimozhi/ . rAmAnusa nURRanthAdhi pAsuram 40 – http://divyaprabandham.koyil.org/index.php/2016/08/ramanusa-nurranthadhi-40/ – English translation by raghurAm swamy. Full series can be viewed at http://divyaprabandham.koyil.org/index.php/2015/07/ramanusa-nurranthadhi/ . AzhwArthirunagari – pakshirAjar uthsavam first 6 days (upto yesterday) – http://azhwarthirunagari.koyil.org/?p=1047 . SrIperumbUthUr – Adi uthram (yesterday) – http://sriperumbuthur.blogspot.com/2016/08/august-2016-week-1.html . thiruvAimozhi 3.3.5 – sOdhiyAgi – http://divyaprabandham.koyil.org/index.php/2016/08/thiruvaimozhi-3-3-5-sodhiyagi/ – English translation. Full series can be viewed at http://divyaprabandham.koyil.org/index.php/thiruvaimozhi/ . thirumAlalai – pAsuram 3 – http://divyaprabandham.koyil.org/index.php/2016/08/thirumalai-3/ – English translation by T N krishNan swamy. Full series can be viewed at http://divyaprabandham.koyil.org/index.php/2016/07/thirumalai/ . This entry was posted in Uncategorized on August 6, 2016 by Sarathy Thothathri. AzhwArthirunagari – ANdAL thirunakshathra mahOthsavam day 10 (yesterday) – http://aathaan.koyil.org/index.php/2016/07/2016-andal-thirunakshathra-mahothsavam/ . SrIperumbUthUr – Adi pUram, ANdAL thirunakshathra mahOthsavam day 10 (yesterday) – http://sriperumbuthur.blogspot.com/2016/08/august-2016-week-1.html . SrIvillipuththUr – ANdAL thirunakshathra mahOthsavam – day 9 (yesterday) – http://srivilliputhur.koyil.org/?p=527 . thiruvallikkENi – ANdAL thirunakshathra mahOthsavam – day 10 (yesterday) – http://thiruvallikkeni.koyil.org/?p=590 . vAnamAmalai – ANdAL thirunakshathra mahOthsavam – day 10 (yesterday) – http://vanamamalai.koyil.org/?p=845 . SrIvaishNava granthams – thathva thrayam – ISwara (Who is God?) – https://srivaishnavagranthamshindi.wordpress.com/2016/08/05/thathva-thrayam-iswara-who-is-god/ based on https://ponnadi.blogspot.in/2013/03/thathva-thrayam-iswara-who-is-god.html – Hindi translation by bhagavathi ammangar . Full series available at https://srivaishnavagranthamshindi.wordpress.com/thathva-thrayam/ . With this, the series comes to an end. dhivya prabandham – thiruvAimozhi 3.3.4 – Isan vAnavarkku – http://divyaprabandham.koyil.org/index.php/2016/08/thiruvaimozhi-3-3-4-isan-vanavarkku/ – English translation. Full series can be viewed at http://divyaprabandham.koyil.org/index.php/thiruvaimozhi/ . AzhwArthirunagari – ANdAL thirunakshathra mahOthsavam day 9 (yesterday) – http://aathaan.koyil.org/index.php/2016/07/2016-andal-thirunakshathra-mahothsavam/ . SrIperumbUthUr – Adi magam, ANdAL thirunakshathra mahOthsavam day 9 (yesterday) – http://sriperumbuthur.blogspot.com/2016/08/august-2016-week-1.html . SrIvillipuththUr – ANdAL thirunakshathra mahOthsavam – day 8 (yesterday) – http://srivilliputhur.koyil.org/?p=527 . thiruvallikkENi – ANdAL thirunakshathra mahOthsavam – day 9 (yesterday) – http://thiruvallikkeni.koyil.org/?p=590 . vAnamAmalai – ANdAL thirunakshathra mahOthsavam – days 7 and 8 (upto day before yesterday) – http://vanamamalai.koyil.org/?p=845 . thiruvAimozhi 3.3.3 – aNNal mAyan – http://divyaprabandham.koyil.org/index.php/2016/08/thiruvaimozhi-3-3-3-annal-mayan/ – English translation. Full series can be viewed at http://divyaprabandham.koyil.org/index.php/thiruvaimozhi/ . rAmAnusa nURRanthAdhi pAsuram 39 – http://divyaprabandham.koyil.org/index.php/2016/08/ramanusa-nurranthadhi-39/ – English translation by raghurAm swamy. Full series can be viewed at http://divyaprabandham.koyil.org/index.php/2015/07/ramanusa-nurranthadhi/ . Arththi prabandham – pAsuram 19 – http://divyaprabandham.koyil.org/index.php/2016/08/arththi-prabandham-19/ – English translation by santhAnam swamy. Full series can be viewed at – http://divyaprabandham.koyil.org/index.php/2016/05/arththi-prabandham/ . AzhwArthirunagari – ANdAL thirunakshathra mahOthsavam day 8 (yesterday) – http://aathaan.koyil.org/index.php/2016/07/2016-andal-thirunakshathra-mahothsavam/ . SrIperumbUthUr – Adi Ayilyam, ANdAL thirunakshathra mahOthsavam day 8 (yesterday) – http://sriperumbuthur.blogspot.com/2016/08/august-2016-week-1.html . SrIvillipuththUr – ANdAL thirunakshathra mahOthsavam – day 7 (yesterday) – http://srivilliputhur.koyil.org/?p=527 . thiruvallikkENi – ANdAL thirunakshathra mahOthsavam – day 8 (yesterday) – http://thiruvallikkeni.koyil.org/?p=590 . bhagavath gIthA – 2nd chapter, SlOkams 34 and 35 added in http://githa.koyil.org/index.php/chapter-2/ based on http://githa.koyil.org/index.php/chapter-2-original/ . SrIvaishNava granthams – Divine revelations of lOkAchArya – Part 2 – https://srivaishnavagranthamshindi.wordpress.com/2016/08/02/divine-revelations-of-lokacharya-2/ based on http://ponnadi.blogspot.in/2013/07/divine-revelations-of-lokacharya-2.html – Hindi translation by kArthik swamy . Full series available at https://srivaishnavagranthamshindi.wordpress.com/divine-revelations-of-lokacharya/ . thiruvAimozhi 3.3.2 – endhai thandhai – http://divyaprabandham.koyil.org/index.php/2016/08/thiruvaimozhi-3-3-2-endhai-thandhai/ – English translation. Full series can be viewed at http://divyaprabandham.koyil.org/index.php/thiruvaimozhi/ . Arththi prabandham – pAsuram 18 – http://divyaprabandham.koyil.org/index.php/2016/08/arththi-prabandham-18/ – English translation by santhAnam swamy. Full series can be viewed at – http://divyaprabandham.koyil.org/index.php/2016/05/arththi-prabandham/ . Commencement of uploading yathirAja vimSathi English translation – http://divyaprabandham.koyil.org/index.php/2016/08/yathiraja-vimsathi/ based on http://divyaprabandham.koyil.org/index.php/2015/10/yathiraja-vimsathi-tamil/ . Translation by Dr M Varadarajan swamy. avathArikai, thaniyan and first 3 SlOkams uploaded by vEnkatEsh swamy. This was previously published in SrI rAmAnuja dharSanam monthly magazine. AzhwArthirunagari – ANdAL thirunakshathra mahOthsavam day 7 (yesterday) – http://aathaan.koyil.org/index.php/2016/07/2016-andal-thirunakshathra-mahothsavam/ . SrIperumbUthUr – Adi pUsam, ANdAL thirunakshathra mahOthsavam day 7, prathivAdhi bhayankaram aNNan thirunakashthram celebrations (yesterday) – http://sriperumbuthur.blogspot.com/2016/08/august-2016-week-1.html . 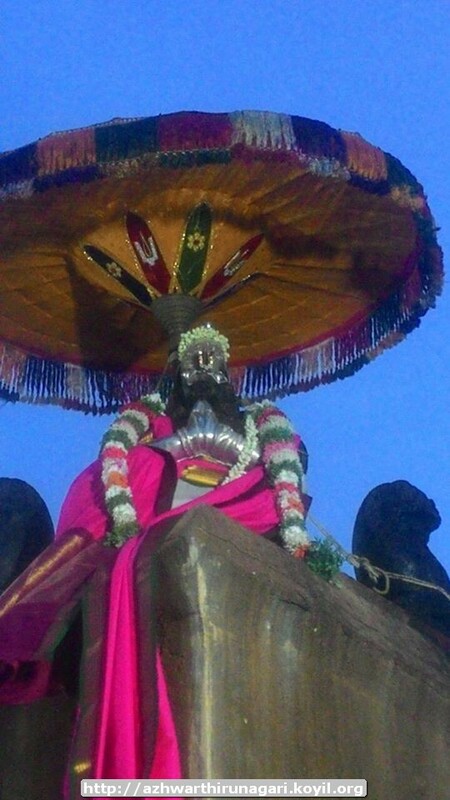 SrIvillipuththUr – ANdAL thirunakshathra mahOthsavam – day 6 (yesterday) – http://srivilliputhur.koyil.org/?p=527 . thiruvallikkENi – ANdAL thirunakshathra mahOthsavam – day 7 (yesterday) – http://thiruvallikkeni.koyil.org/?p=590 . SrIvaishNava Education/Kids Portal – Who is SrIman nArAyaNa? – http://pillai.koyil.org/index.php/2016/08/beginners-guide-who-is-sriman-narayana-tamil/ based on http://pillai.koyil.org/index.php/2014/07/beginners-guide-who-is-sriman-narayana/ – thamizh translation by geethA ammangar as part of Beginner’s guide (ஸ்ரீவைஷ்ணவம் – பால பாடம்) – http://pillai.koyil.org/index.php/beginners-guide-tamil/ based on http://pillai.koyil.org/index.php/beginners-guide/ . thiruvAimozhi 3.3.1 – ozhivil kAlam – http://divyaprabandham.koyil.org/index.php/2016/08/thiruvaimozhi-3-3-1-ozhivil-kalam/ – English translation. Full series can be viewed at http://divyaprabandham.koyil.org/index.php/thiruvaimozhi/ . thirumAlalai – pAsuram 2 – part 2 – http://divyaprabandham.koyil.org/index.php/2016/08/thirumalai-2-part-2/ – English translation by T N krishNan swamy. Full series can be viewed at http://divyaprabandham.koyil.org/index.php/2016/07/thirumalai/ . AzhwArthirunagari – ANdAL thirunakshathra mahOthsavam day 6 (yesterday) – http://aathaan.koyil.org/index.php/2016/07/2016-andal-thirunakshathra-mahothsavam/ . SrIperumbUthUr – Adi punarpUsam, ANdAL thirunakshathra mahOthsavam day 6 (yesterday) – http://sriperumbuthur.blogspot.com/2016/08/august-2016-week-1.html . SrIvillipuththUr – ANdAL thirunakshathra mahOthsavam – day 5 (yesterday) – http://srivilliputhur.koyil.org/?p=527 . vAnamAmalai – ANdAL thirunakshathra mahOthsavam – upto day 6 (upto yesterday) – http://vanamamalai.koyil.org/?p=845 . SrI rAmAnuja dharsanam – e-magazine – August/Adi – english Issue recently released and can be viewed at http://www.varavaramuni.com/home/sriramanuja-dharsanam-magazine/english . dhivya prabandham – Commencement of thiruvAimozhi 3.3 decad – http://divyaprabandham.koyil.org/index.php/2016/08/thiruvaimozhi-3-3-ozhivil/ – English translation. Full series can be viewed at http://divyaprabandham.koyil.org/index.php/thiruvaimozhi/ . AzhwArthirunagari – ANdAL thirunakshathra mahOthsavam day 5 (yesterday) – http://aathaan.koyil.org/index.php/2016/07/2016-andal-thirunakshathra-mahothsavam/ . 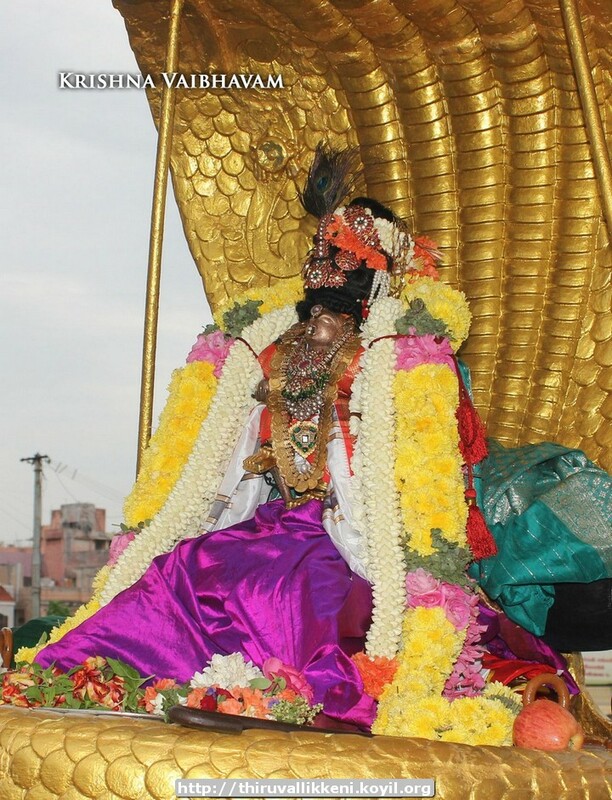 kUram – thiruppAvAdai uthsavam (yesterday) – http://kuram.koyil.org/?p=480 . SrIperumbUthUr – Adi thiruvAdhirai, ANdAL thirunakshathra mahOthsavam day 5 (yesterday) – http://sriperumbuthur.blogspot.com/2016/07/july-2016-week-5.html . 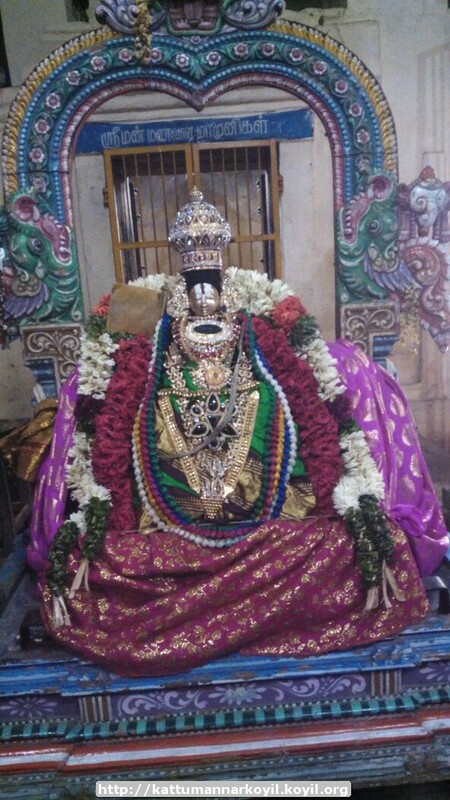 SrIvillipuththUr – ANdAL thirunakshathra mahOthsavam – day 4 (yesterday) – http://srivilliputhur.koyil.org/?p=527 . thiruvallikkENi – ANdAL thirunakshathra mahOthsavam – day 5 (yesterday) – http://thiruvallikkeni.koyil.org/?p=590 . SrIvaishNava Education/Kids Portal – new article “ALavandhAr’s Sishyas – Part 2” – http://pillai.koyil.org/index.php/2016/08/beginners-guide-alavandhars-sishyas-2/ by jAnaki ammangar as part of Beginner’s guide (http://pillai.koyil.org/index.php/beginners-guide/) series. thiruvAimozhi 3.2.11 – uyirgaL ellA – http://divyaprabandham.koyil.org/index.php/2016/07/thiruvaimozhi-3-2-11-uyirgal-ella/ – English translation. Full series can be viewed at http://divyaprabandham.koyil.org/index.php/thiruvaimozhi/ . pramEya sAram – hindi translation – http://divyaprabandham.koyil.org/index.php/2015/12/prameya-saram-hindi/ based on http://divyaprabandham.koyil.org/index.php/2015/12/prameya-saram/ – translated by kEshav swamy and uploaded by lakshmi narasimhan swamy.